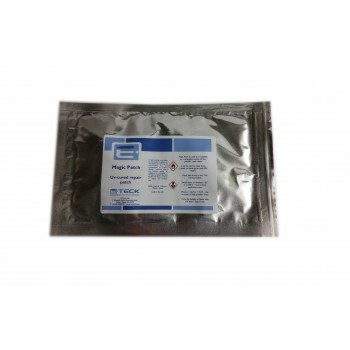 E-Teck Magic Patch epoxy adhesive 150 x 75 mm. Easy to use, just cut to size, peel off backing and press into place.Uncured it is soft and pliable – Easily moulded to repair area contour. Once cured is strong, rot-proof and durable, resists attack from a wide variety of acids and solvents.Cures by daylight, or faster with UV lamp . Easy to use. You're reviewing: E-Teck Magic Patch epoxy adhesive 150 x 75 mm.